The Deep Creek Open and U.S. National Canoe & Kayak Championships will be held the weekend of Sept. 8 and 9, at the Adventure Sports Center International (ASCI). It is expected to once again draw the world’s best paddlers to western Maryland to compete at the unique mountain-top course in the ultimate event of slalom whitewater competition. “A challenging course will be set on the world’s only mountaintop, self-contained, artificial whitewater channel that draws the senior international teams, including many of the competitors from the London Olympics, as well as the entire U.S. Olympic Team and the current U.S. national and junior teams,” said a spokesperson. Competitors for both competitions will traverse the same course set-up but will be separated for judging. U.S. paddlers will have the opportunity to place in both the Deep Creek Open and Nationals. The competition will welcome all spectators to the riverside, pedestrian pathways, and/or bridge overlooking the top of the course to watch whitewater racing with family and friends. Canoe slalom is a competitive sport in which either individuals or teams of two navigate a decked canoe or kayak through a course of hanging gates in the fastest time possible. Canoers kneel in their boats and use a single blade paddle, while kayakers sit and use a double bladed paddle. It is one of the two kayaking and canoeing disciplines at the Summer Olympics, with the other being canoe sprint (which is held on flatwater). The color of the gates indicates which direction they must be navigated, upstream or downstream. Time penalties are added for touching gates or failing to navigate gates correctly. ASCI has successfully hosted many notable whitewater races, from the U.S. Rafting Nationals in 2009 to the ACA’s Open Canoe Slalom Nationals and the North American Canoe Kayak Championships in 2010. ASCI will also have the honor of hosting the esteemed International Canoe Federation’s (ICF) Canoe Slalom World Championships in 2014. This is only the second time in history that the Worlds have been held in the United States. The first time was in 1989, also in Garrett County on the Savage River. ASCI is a non-profit, 501(c)(3) organization that operates both a 15-acre site on top of Marsh Mountain, home to ASCI’s headquarters and the whitewater course, and a 550-acre nature preserve called Fork Run, home to many climbing routes on natural faces and over 10 miles of mountain bike trails. ASCI’s core programs include guided rafting adventures down the whitewater course, guided climbing trips at Fork Run rocks, and instructional courses in kayaking, river boarding, and climbing. ASCI also offers winter programming that includes cross-country skiing and snowshoeing. To learn more about the competitions, persons may contact Nicolas at 301-387-3250 or via e-mail at snicolas@deepcreek2014.com. Those interested in serving a crucial role as a volunteer for the event can visit www.adventuresportscenter.com to complete a volunteer form. MCHENRY — When the 2014 World Championship Canoe and Kayak Slalom Races come to the Adventure Sports Center International in Garrett County, organizers will use experience from their travel to Slovakia to observe this year’s event. ASCI, in conjunction with USA Canoe and Kayak, was awarded the winning bid to host the premier event for Olympic whitewater canoe and kayak races earlier this year. ASCI competed with Poland and Austria for this designation. Following the award, Deep Creek 2014­ LLC was created as a subsidiary of ASCI to act as the official host entity for the races. Garrett County Commission Chairman Gregan Crawford will serve as co-chairman along with Terry Hasseltine of the Maryland Office of Sports Marketing, which recently helped organize the Grand Prix auto races in Baltimore. They were joined by Garrett County Economic Development Director Jim Hinebaugh, Susanne Nicolas of ASCI/Deep Creek 2014 and board member Bob Campbell of Whitewater Parks International of Boulder, Colo., on an eight-day trip to Bratislava, Slovakia, to observe the 2011 World Championship and Kayak Slalom Races. The races in 2014 will mark 25 years since world championship canoe and kayak slalom races were held in the U.S. on Savage River near Bloomington. Those races helped to generate more than $12 million economic benefit to the state and county. Throughout the event in Bratislava, the group’s credentials allowed for unprecedented access to all areas of the race venue including medical, judging, athlete village, video review, protest challenges, media sources and areas around the course typically off-limits to many event organizers. “This was quite a rewarding experience,” Crawford said. The group representing Deep Creek 2014 had access to senior members of the International Canoe Federation, which sponsors the event, many of whom had participated in the 1989 World Championship. The ICF looks forward to expanding more into the U.S. marketplace and gaining greater exposure for its sport, and the county commissioners are willing to help them to achieve those goals when practical, according to County Administrator Monty Pagenhardt. The county has appropriated $25,000 to Deep Creek 2014 to be administered by the Department of Economic Development. In addition, ASCI, Garrett County government and the state of Maryland will be placed on the international stage with such cities as Bratislava, Prague of the Czech Republic and London, which will play host of the 2012 Summer Olympics. Gregan Crawford, Board of Garrett County Commissioners, and Director Jim Hinebaugh, GC Department of Economic Development, traveled to Bratislava, Slovakia, to get a behind-the-scenes look at what it takes to stage an international sporting event. The capital city was hosting the 2011 International Canoe Federation’s (ICF) World Championship Canoe and Kayak Slalom Races. More than 400 athletes from 49 nations competed. Garrett County will host a similar event in 2014. Those included the athletes’ village and medical, judging, video review, and protest areas. Crawford indicated the ability to observe the race and talk with ICF members from around the world provided valuable information and would help the county prepare for its own event. Following its April 15 board meeting in Paris, the ICF awarded the Adventure Sports Center International’s (ASCI) bid to host the federation’s 2014 Canoe Slalom World Championships. ASCI beat out competing entries from Austria and Poland. MCHENRY, Md. — Canoeists and kayakers are competing in Maryland’s first state paddling championships in McHenry. Organizers of the event at Adventure Sports Center International overlooking Deep Creek Lake said the slalom races were held on the upper section of the center’s whitewater course. The mountaintop sports center is hosting the International Canoe Federation’s canoe slalom world championships in 2014. — MCHENRY — Competitors from around the region will participate in the first-ever Maryland Canoe and Kayak State Championships at the Adventure Sports Center International from 4 to 6 p.m. on Saturday. The center is home of the world’s only mountaintop whitewater course. The championship is part of the 2011 Maryland Canoe and Kayak Series produced by the Bethesda Center of Excellence. BCE is led by two-time Olympic silver medalist Dana Chladek and will be fielding a team of up-and-coming athletes at the event. The state championships will be a first glimpse of whitewater competition at ASCI since it was awarded the ICF 2014 Canoe Slalom World Championships. ASCI won out over bids from Austria and Poland at the April meeting of the International Canoe Federation in Paris. Deep Creek 2014, the official title of the championships, is scheduled for Sept.17-21. The event will mark the 25th anniversary of the highly successful 1989 Canoe Slalom World Championships held on Savage River in Garrett County. Canoe slalom refers to decked or covered whitewater boats that race a series of gates strategically placed over rapids. The four official Olympic disciplines include single men and women’s kayak, and single and double canoes. Maryland has historically fielded the nation’s most successful slalom athletes, including World Champions Jon Lugbill, Davey Hearn, Fritz and Lecky Haller, Cathy Hearn, Dana Chladek and Olympic Gold Medalist Joe Jacobi. Bill Endicott, the most successful canoe coach in U.S. history, is also based in Maryland. The Maryland State Championships will be the first and only state-level whitewater competition in the county. They will take place on the upper section of the ASCI whitewater course. Each run lasts around 100 seconds, and athletes must navigate 20 gates covering 300 meters of rapids. At least six of the gates require athletes to paddle upstream. Hitting the poles or missing a gate entirely adds penalties to a score. The score is a racer’s time plus penalties, and the lowest score wins. Spectators can watch from rocks alongside the river or from the grass-sloped amphitheater. For more information, call 301-387-3250, email asci@adventuresportscenter.com or visit www.adventuresportscenter.com. Competitors from around the region will compete in the first ever Maryland Canoe and Kayak State Championships at the Adventure Sports Center International (ASCI), home to the world’s only mountaintop whitewater course, on Saturday, Aug. 13, from 4 to 6 p.m. The championship is part of the 2011 Maryland Canoe and Kayak Series produced by the Bethesda Center of Excellence. BCE is marketed as the nation’s premier slalom canoe/kayak training center and is home to two-time Olympic silver medalist Dana Chladek. Chladek is the BCE head coach and will field a team of “young up and coming athletes” at the event. The state championships will be a first glimpse of whitewater competition at ASCI since it was awarded the International Canoe Federation’s 2014 Canoe Slalom World Championships. ASCI won out over bids from Austria and Poland at the April meeting of the ICF held in Paris. “Deep Creek 2014,” the official title of the ICF 2014 Canoe Slalom World Championships, is scheduled for September 17 through 21. The event will also mark the 25th anniversary of the highly successful 1989 Canoe Slalom World Championships held on the Savage River in Garrett County. Canoe slalom refers to ‘decked’ or ‘covered’ whitewater boats which race a series of gates strategically placed over rapids. The four official Olympic disciplines are: single men and women’s kayak (where athletes sit in the boat and use a double bladed paddle) and single and double canoe (where athletes kneel in the boat and use a single bladed paddle). Maryland has historically fielded the nation’s most successful slalom athletes, including world champions Jon Lugbill, Davey Hearn, Fritz and Lecky Haller, Cathy Hearn, Dana Chladek and Olympic gold medalist Joe Jacobi. Bill Endicott, who is heralded as the most successful canoe coach in U.S. history, is also based in Maryland. The Maryland State Championships will be the first and only state-level whitewater competition in the country. The championships will take place on the upper section of the ASCI whitewater course. Each run will last around 100 seconds, and athletes will be required to navigate 20 gates while covering 300 meters of rapids. The Adventure Sports Center International, home of the world’s only mountaintop whitewater course, is set to host Maryland’s first Canoe and Kayak Championships on Saturday, Aug. 13. Competitors from around the region are expected to compete in that event. The state championship is a precursor to the upcoming Deep Creek 2014, the official name given to the 2014 Canoe Slalom World Championships by the International Canoe Federation. In the photo above, Dr. Jay Ditty of Morgantown, W.Va., navigates the whitewater of ASCI in a recent slalom canoe event. The International Canoe Federation (ICF) has awarded the 2014 Canoe Slalom World Championships to Adventure Sports Center International (ASCI), based in McHenry. Following presentations at its April 15 spring board meeting in Paris, ICF selected ASCI’s Deep Creek 2014: ICF Canoe Slalom World Championships bid over competing entries from Vienna, Austria, and Krakow, Poland. The event, to be held September 16-21, 2014, will mark the 25th anniversary of the 1989 World Championships held on the Savage River in Garrett County and represents a return of world championship whitewater canoe and kayak racing to the United States for the first time since the 1989 event. The 1989 Worlds attracted more than 600 competitors representing 26 nations. More than 40,000 spectators attended racing events and the opening ceremonies. 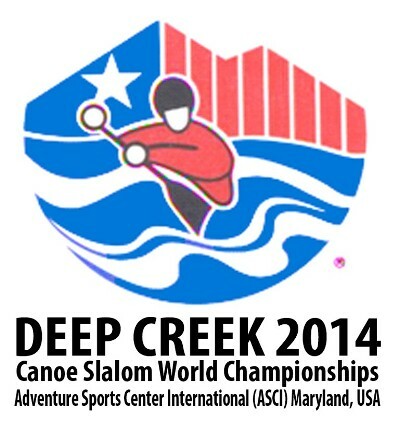 ASCI’s Deep Creek 2014 bid was submitted at the end of February and was reviewed in March by the ICF Slalom Committee. It received high marks by the committee and was formally accepted as the recommended bid, but the committee members stressed the need for a high-level delegation to make a personal presentation of the bid at the Paris board meeting. The presentation was given by Joe Jacobi, CEO of U.S.A. Canoe/Kayak; Commissioner Crawford; Taylor; and Suzanne Nicolas, ASCI’s event coordinator.